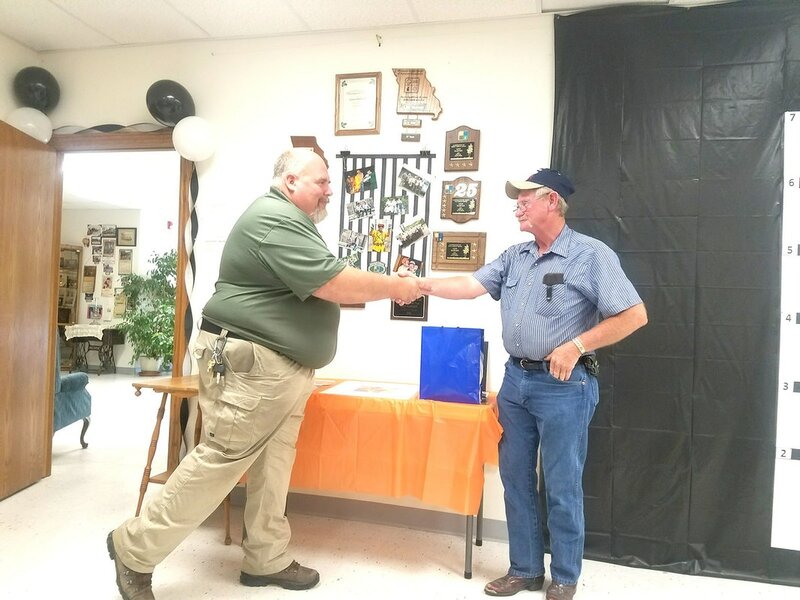 After 35 years at Roaring River State Park, longtime employee Leon Mahurin retired. 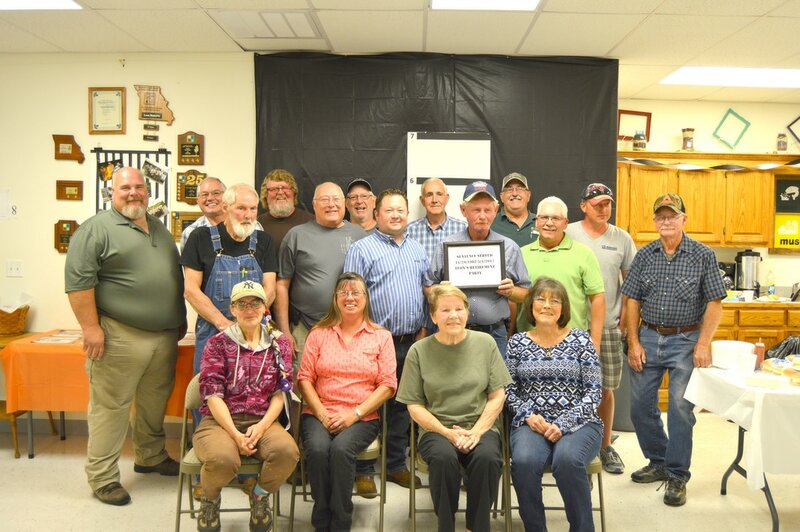 Friends and family gathered to celebrate Mahurin’s retirement at the Barry County Museum and share memories with him from over the years. Mahurin grew up around Pineville and Anderson before eventually moving to the area and graduating from Exeter High School. It was after that when Mahurin began working at the park. Mahurin said that his time was spent in the early days cleaning up and providing maintenance in the summer. Back then, he was a temporary employee just doing some summer work. However, the park superintendent at the time, Boyd Holcomb, told him if he stayed with them, he would have a permanent job. Lo and behold, 35 years later, Mahurin finally left the park to retire. Other superintendents oversaw the park in Mahurin’s time after Holcomb left, as well, but one was present at his retirement celebration. Dusty Reid was with the park from 1995 to 2014. For the last eight of those years, he served as the park’s superintendent. Reid said, “Leon was one of the most respected employees at the park. He said he remembers the bigger changes of the park being the addition of the Emory Melton Inn and Conference Center. Mahurin was always in maintenance while at the park. In 35 years, he learned the ins and out of the park and equipment, helped clean up, did tree and brush removal and more. As people retired, he said he would learn more about the equipment in the park and take that over. Reid said, “He loved to have a good time and keep things light hearted but when it was time to get things done, he was always ready and willing to put in a long days work. You could always count on Leon to help with the storms, floods and any other emergency that might pop-up. He also loved working with the younger park staff. He welcomed the State Park Youth Corps and would always take a little extra time teaching them new skills and helping them learn new things. “I always felt fortunate having great staff like Leon around. The years of history he could share was so valuable. Knowing where utility lines from the 70’s were buried, or how the old lagoon worked was priceless. When asked did he enjoy working at Roaring River all these years? “Yeah, for the most part, I really did,” he replied. His only big complaint is that people don’t take their time as much anymore. He said, “Everything is in the fast lane, and I think people should slow down and kick a few rocks.” And he doesn’t just mean at the park. Mahurin is working part-time at Cassville Schools in maintenance, as well. Mahurin and his wife, Schrediah, live in Washburn. They have two children, Tiffany and Leon, and three grandchildren, Ethan, Waylon and Cash. Guests at Mahurin’s retirement party are pictured above, from left to right. In the front row: Elise Buchman; Mary Melacon; Jan Bunyar; and Sharon Hopkins. Middle row: Tim Smith; Gerald “Zero” Phillips; Marc Landrith; Dusty Reid, former park superintendent; Leon Mahurin; and Rick Hendrix. Back row: Dennis Melancon; Bill Ash; Randall Norman; Jimmy Hopkins, former Park Ranger; Merle Rogers, former park naturalist; Dusty Hall; and Harvey Henry. Tim Smith, park naturalist, shakes hands with Mahurin at this retirement celebration. 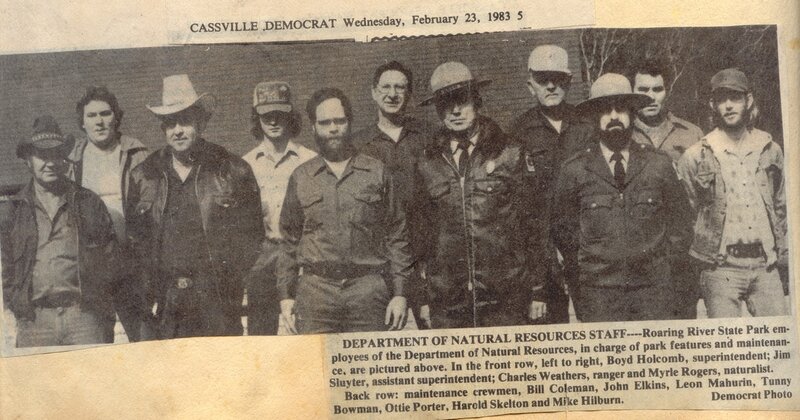 Above is a newspaper clipping from the Cassville Democrat from 1983 featuring Mahurin and other staff members at Roaring River at that time.